Born to the French nobility, the daughter of Baron Charles de Trenquelléon and Marie-Ursule de Peyronnencq de Saint-Chamarand, she was related through her mother to Saint Louis IX; she was baptized when only a few hours old. Her father, the baron, fought on the side of King Louis XVI in the French Revolution in 1791, which led to exile for him and his family to England in November 1791, then Spain in 1797, then Portugal in 1798, back to Spain in 1800, and finally a return to France in 1801. Adèle made her First Communion on 6 January 1801 in San Sebastian, Spain, and received Confirmation on 6 February 1803 from the bishop of Agen, France. In her early teens, Adèle began to feel a call to religious life, and wanted to join the Carmelites, but her mother convinced her to wait till she was grown to make the decision. On 5 August 1803 Adèle and some like-minded friends founded the Little Society, an informal group for spiritual study and support which Adèle encouraged by active correspondence, and which by 1808 had about 60 members, laity and priests. Adèle started visiting the area sick at home, and brought poor children to her home to teach them the faith. Learning of a group founded by Blessed William Joseph Chaminade in Bordeaux, France, the Sodalities of Our Lady, that was similar to the Little Society, Adèle began corresponding with Chaminade. By 1809 the Society had been modified to be more like Chaminade's Sodality. On 20 November 1808, Adèle rejected an offer of marriage and concluded that she would enter religious life at some point. Family obligations and government edicts, however, delayed her work until 1816. With some guidance by Chaminade, Adèle renounced her inheritance in favour of her brother, Charles, said good-bye to her family, and with some like-minded members of both the Society and Sodality, she moved into a vacant convent in Agen, France and started the Daughters of Mary Immaculate (Marianist Sisters). The Sisters combined the contemplative nature of the Carmelites with a mission to teach, Adèle served as their first superior, and the group made their first vows on 25 July 1817. Adèle became friends with Saint Émilie de Rodat in 1819, and the two corresponded regularly. The Sisters continued to grow, but Adèle's health began to fail. From 1825 on she was restricted to a correspondence ministry, and spent the last months of her life working for the expansion and recognition of the Sisters. The Sisters continue their good work today with about 340 members spread out in Togo, Ivory Coast, the United States, Brazil, Chile, Colombia, Ecuador, Argentina, South Korea, Japan, India, Spain, France and Italy. The fourth of seven children born to Tomas Rodríguez Sopeña, a lawyer, magistrate and administrator, and Nicolasa Ortega Salomon. Eye surgery at age eight left her with limited sight the rest of her life. A debutante at age 17, Maria did not care for the wordly life, and fearing that her parents would stop her, she secretly began working with the sick and poor. This was a time when a lady of her standing in society would never be found in the poor neighborhoods, never working with the poor herself. But Maria's faith gave her endless confidence, and she was motivated by a desire to have "one family in Christ Jesus"
In 1868 when she was 20, Maria's father was transferred to Puerto Rico where he eventually became a state attorney; the rest of the famly moved to Madrid, Spain. There Maria found a spiritual advisor and began catechizing women in prisons, hospitals and Sunday schools. The entire family moved to Puerto Rico in 1872 during a time of schism and religious disruption, and she found a Jesuit priest to be her spiritual director. Maria's poor sight ended an attempt to join the Sisters of Charity, and when she tried to work on her own, the religious upheaval limited her to visiting only the sick in the safety of a military hospital. When the situation settled she founded the Centers of Instruction and the Association of the Sodality of the Virgin Mary who staffed the Centers. There they taught reading, writing and religion, and provided medical help where needed. Maria's mother died, her father retired, and the family returned to Madrid in 1877. Maria became the matriarch of the family, found a new spiritual advisor, and resumed her work with the poor and sick. Following the death of her father in 1883, she joined a Salesian convent. That lasted ten days; she realized that the cloistered, contemplative life was not for her. In 1885 Maria opened a center where the poor could bring social problems to be resolved, and which was similar to a modern half-way house, helping prisoners return to society. The terrible conditions of the poor that she witness led to the formation of the organization Works of the Doctrines; due to anti-clerical attitudes in the 20th century, these became known as the Center for the Workers. In 1892 she founded the Association of the Apostolic Laymen (Sopeña Lay Movement), and in 1893 she received government approval to expand her work into eight poor and crowded Madrid neighborhoods. In 1896 she began working throughout Spain, founding additional Works of the Doctrines. She made a pilgrimage to Rome in 1900, and received approval to form a religious institute to continue the work of the Works and Association. With eight companions and co-workers, she founded the Ladies of Catechistical Institute on 24 September 1901 in Toledo, Spain. She founded the Social and Cultural Work Sopeña (OSCUS) which received government approval in 1902, papal approval in 1907, and is today known as the Sopeña Catechetical Institute. Maria was chosen Superior General of community in 1910, and they expanded into the Americas in 1917. Her legacy continues today in the Sopeña Catechetical Institute, The Sopeña Lay Movement and the Sopeña Social and Cultural Work working in Spain, Italy, Argentina, Colombia, Cuba, Chile, Ecuador, Mexico and the Dominican Republic. Daughter of Theodore Aviat, a shopkeeper, and Emilie Caillot. Baptized 17 September 1844; Confirmed on 2 July 1856. Educated at the Visitation School in Troyes, France from age eleven to sixteen. With Father Louis Brisson and Mother Marie Therese de Sales Chappuis, she founded the Sister Oblates of Saint Francis de Sales in Troyes, dedicated to helping young women who poured into the cities during the Industrial Revolution. She took the Salesian Rule for the congregation. She entered religious life on 11 April 1866, took the veil on 30 October 1868, taking the name Sister Frances de Sales, and made her final vows on 11 October 1871. Superior of the Institute in 1872. Opened homes and schools for working class girls. Exiled from France on 11 April 1904 due to religious persecution and anti-religious legislation. She rebuilt her congregation from Perugia, Italy, and the Order was approved by Pope Saint Pius X in 1911. Born to a wealthy, noble, and prominent family. Married at age 18 to Felicitas, and the father of one son, Peter, who became the Doge of Venice in 991. Admiral and commander of the Venetian fleet by age 20. Rid the Adriatic Sea of pirates. Chosen Doge of Venice on 12 August 976, the day after a revolt, the murder of his predecessor, and a fire that destroyed much of the city. Built hospitals and orphanages, started reconstruction of the Cathedral of Saint Mark, and began social programs to help widows, orphans, pilgrims, and the abandoned. He poured much of his own fortune into the effort, and within two years Peter had restored law and order, and rebuilt much of the city. Rightly considered one of Venice's greatest rulers. In the night of 1 September 978, believing his duty to the world fulfilled, and possibly feeling crushed by it all, Peter secretly left Venice for the Benedictine monastery of Saint-Michel-de-Cuxa in the Pyrenees on the border of France and Spain, not even telling his family of his plans. Benedictine monk. While the move was sudden, it was apparently something he'd been considering for over a decade. When his wife learned of his move, she approved; they'd lived chastely since the birth of their son, and she knew of his spiritual yearnings. 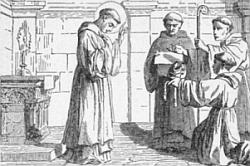 Spiritual student of Saint Romuald at Saint-Michel-de-Cuxa at whose suggestion he built a hermitage, and retired even further from the world, spending the rest of his life in solitude and prayer. Paul grew up in an upper-class, Christian family. He was well educated, fluent in Greek and Egyptian. His parents died when the boy was 15. When the persecutions of Decius began a few years later, Paul fled into the desert to escape both them, and the machinations of his brother Peter and other family members who wanted his property. He lived as a desert hermit in a cave the remainder of his 113 year life, surviving off fruit and water, wearing leaves or nothing, spending his time in prayer; legend says a raven kept him supplied with bread. Late in life he came to know, and was buried by Saint Anthony the Abbot. His biography was written by Saint Jerome. Member of the family of the Counts of Nevers, his father Baldwin planned a military life for William. Educated by his maternal uncle, Peter the Hermit, archdeacon of Soissons, France. Drawn to religious life from an early age, William became a priest, canon of Soissons, and canon of Paris. Monk in the Order of Grandmont, noted for his austerities, his devotion to the Blessed Sacrament, and for the time spent praying at the altar. Internal dissension in the Order caused him to leave Grandmont for the recently formed Cistercians, taking the habit at Pontigny. Abbot at Fontaine-Jean in Sens, France. Abbot at Chaalis near Senlis, France in 1187. Reluctant archbishop of Bourges, France in 1200, accepting the position only after receiving orders from the general of his order, and from Pope Innocent III. Lived an even more austere life, defended clerical rights against the state, cared personally for the poor, sick, imprisoned and debauched, and converted many Albigensians in his diocese to orthodox Christianity. Witnesses claim he performed 18 miracles during his life, and another 18 after his death. Worked for Cardinal Jacopo of Palestrina. Archdeacon of Liege, Belgium. Assigned to preach the last Crusade. Accompanied the Crusaders to Palestine, and was still there when elected Pope; he was elected before being ordained a priest. Ordained on 19 March 1272. 184th pope. Worked to restore peace between Christian nations and rulers, for the recovery of the Holy Lands from Muslims, and to reform the spiritual lives of clergy and laity. Called the Council of Lyons which briefly reconciled the Orthodox and Latin Churches. Tried to restore peace between the Guelphs and Ghibellines in Tuscany and Lombardy, and excommunicated those who worked against the reconciliation. Crowned Rudolf of Habsburg as Holy Roman Emperor and settled the fight over the crown among German princes. Educated at a convent. Over the objection of her family, she became a Dominican nun in 1618; she wore the veil for 68 years. Novice mistress for many years. Prioress at the monastery of San Caterina da Siena. Married layman and successful businessman for most of his life. In maturity he finally followed a call to God, and with his wife's blessing, he became a monk at Saint Hermes' monastery in Palermo, Sicily. Vatican treasurer. Pope. As pontiff, Agatho brought his business skills to the throne, maintaining the accounting records himself. He worked to resolve a dispute between Saint Wilfrid of York and Saint Theodore of Canterbury concerning diocesan boundaries in England; this was the first known occasion of English bishops appealing to Rome for a decision. He condemned the Monothelite heresy, and wrote definitive texts concerning the nature of Christ's will; his writings and authority swayed the Council of Constantinople, and reunited Constantinople with Rome, though he died before the good news reaches him. Member of a Roman family of Constantinople. Related to Emperor Theodosius II. Ordained in 455. He lived such an austere life that he was wrongly accused of the heresy of Novatianism. Treasurer of the great church Hagia Sophia. Appointed Oikonomos, a position second only to the patriarch in authority. Gave away huge sums from his family fortune, but always anonymously so as not to draw attention to himself. Restored several churches. Composed several hymns, and was known as a miracle worker. One day as he rushed to the consecration of a new church, he encountered a miserable, nearly naked beggar on the street. Marcian gave the man all his clothing, keeping only his chasuble. When he arrived at the church, however, he appeared to be wearing a golden robe under the chasuble; Patriarch Gennadius even rebuked Marcian for dressing so richly. The saint then pulled off the chasuble to show he was naked. Daughter of Saint Isidore of Lentini; related to Saint Neofyta and Saint Neofytus. Thecla was a consecrated virgin, a form of nun that pre-dates congregations. 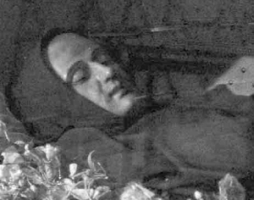 She worked with the poor in Lentini until an unspecified disease left her paralyzed and bed-ridden for six years; she was healed by the prayers of three holy brothers who were immediately imprisoned. Thecla and her servant Justina bribed the guards to let them visit, feed and minister to the brothers and other prisoners until they were each martyred, and then the two women gave them a Christian burial. Raised on a farm at Laurenzana, Naples. Franciscan lay brother. Lived as a hermit in the garden of the Franciscan friary at Laurenzana. Noted for a great love of animals. Married. Noted scholar in literature, philosophy and Biblical studies. Widower. Monk. Bishop of Melitene, Armenia at age 30. Had a special ministry to the poor. Diplomat, sent by the Byzantine emperor to Persia to handle difficult negotiations. Corresponded with Saint Gregory the Great. Spiritual director of the emperor. Premonstratensian canon, entering the Zeliv monastery in Bohemia. Chosen abbot his house in 1406, he served until his death, 16 years later. When Hussite gangs under Jan Zizka came through the area in December 1421, Peter, his brother monks, and other local Catholics fled ahead of them to the town of Nemecky Broad, Bohemia (modern Havlíckuv Brod, Czech Republic). However, Zizka’s troops sacked of the city, captured the Catholics, and executed them. Martyr. Premonstratensian canon. Chosen the second prior of the Saint-Jean monastery in Amiens, France in 1130, he served as the leader of his house for his remaining 26 years; the house was elevated to an abbey in 1135, and Fulk became its abbot. During his leadership, the house attracted so many brothers that they outgrew their structures and they had to add another location outside the city, and it was used by the brothers who sought the quiet. Benedictine monk. Abbot of La Cava, Salerno, Italy from 1171 to 1194. Helped found a new monastery at Monreale, Sicily, sending a hundred monks to staff it. Bishop of Viviers, France. Killed by a mob for defending the rights of the Church in a local matter. Martyr. Eighth-century hermit charcoal-burner in northern Italy known for his holiness. Mercedarian friar. A redeemer who ransomed Christians who had been enslaved by Muslims in North Africa, working in Algeria and Mauritania. Bishop of Armagh, Ireland, from c.623. Involved in the controversy over the proper date for celebrating Easter. Step-daughter of the king of the Angles. Half-sister of Saint Ethelburga and Saint Ethelfreda. Benedictine nun in a convent in Gaul. Abbess. Son of an imperial Roman senator from the area around modern Avignon, France. Monk at Lerins Abbey. Bishop of Die, France c.456. Bishop of Jerusalem who worked to maintain orthodox Christian doctrine, and keep peace within the disputing factions within the Church. Bishop of Cahors, France. Known for knowing the entire Bible by heart.